Have a question and need help? Unlimited Play Passes are priced per child. Unlimited Play Pass entitles child to unlimited play from the 1st day of the month, through the last day of the month, only. 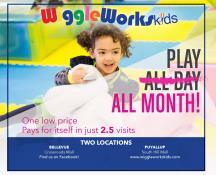 Terms: No additional discounts apply, only usable at WiggleWorks kids Puyallup. Unlimited Play Pass is not eligible for refund after first visit OR 2 weeks after purchase. 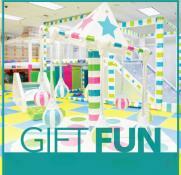 Give the Gift of a Monthly Unlimited Play Pass! 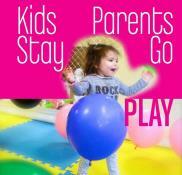 Unlimited Monthly Play Passes are priced per child. Unlimited Play Pass entitles child to unlimited play from the first day of the month through the last day of the month only. Terms: No additional discounts apply, only usable at WiggleWorks kids Puyallup. Unlimited Play Pass is not eligible for refund after first visit OR 2 weeks after purchase. During purchase, please note which month you are purchasing the pass for. We are closed to the general public so you can have the night off and the kiddos can have some fun with us! Playtime on our 1-of-a-kind playground, dinner, movie, and snack are included! We'll be watching a movie, making crafts, playing in sensory bins, and getting the wiggles out while parents enjoy a night free of chaos for only $6.75 an hour for trusted childcare! We'll be watching a movie, making crafts, playing in sensory bins, and getting the wiggles out while parents enjoy a night free of chaos for only $8.00 an hour for trusted childcare! The perfect gift for any occasion! 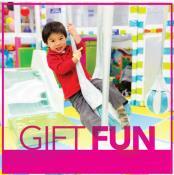 Gift cards can be used toward any activity or product at WiggleWorks kids Puyallup! Buy online and we'll ship it for free to you or your recipient! Gift cards never expire and can be reloaded in $5.00 increments! to see if it's on its way, or click Try Again to start over.